Big hit and good price! It's long lasting and can easily be modified to a refrigerator magnet by adding a small stick on magnetic strip to the back. It would be better as a business card size, though. We order this every year to put in Christmas cards. Most people say they really appreciate getting not only the calendars to carry but also our personal information. I have no complaints. I love the calendars and so do my friends and family that receive them. I have gotten these calendars for years! Very durable and love the size!!! Very durable. I SEND THESE IN MY CHRISTMAS CARDS EVERY YEAR. I buy these every year and put them in my christmas cards. My receivers love them. Pass them out to friends. Keep everywhere I may want a date. I have purchased the wallet calendars before & my friends ask for them every year. I really like them. We use the calendars as a means of getting our name out there. They are free to our clients and it would be nice if the price would be lower. I've been buying these calendars for years to give out to members of my club every Christmas. The members really appreciate them. Great for Business! attention getters! I love to order these calendars from Walter Drake every year! They are easy to carry because when you are at the supermarket or anywhere you can always pull one out and give to your customer. Its so small they can carry with them all year round and your phone number is always handy for them. I have customers who have asked me..do you have a new calendar for me? I always give them several so they can pass on to their friends and family. It is so small they can carry with them all year and reference it whenever they need. The quality is great so the numbers dont fade so your customers can always use them. I love it! I use it as my business card all year long and get business from it. Buy these calendar cards every year! I use these for business and personal use! A very important annual purchase! At Christmas time. As a little gift. Compact size. Easy to read. I used to use these little calendars in my husbands business but after he passed away I started putting a little poem on them instead of the business address and everyone seems to really appreciate them. I have been doing the poem thing now for 15 years. I LOVE them. Cannot recall when I started, on or before 1996 I think. I buy them every year for staff at work, friends and family. Retiring in less than a year,.... might get them one last time (2019) after then,... For fun, and to put "Mr." on them instead of "Lt."
Insert calendars in holiday cards and everyone loves to receive them! I put these calendar cards in all of our rental units. The guests really appreciate this extra touch. These calendar cards are excellent to give to friends and acquaintances for 2017. Calendars perfect for our rental guests! I have many beach rental units and I keep a calendar in each unit next to the note pad holder and pen. The guests appreciate this extra "touch". These are very nice ! We put these in our Christmas cards and people love them ! I purchase these calendars every year and gived them to my church to go into our Guest/Visitor bags. I keep several for myself to pass out as they are perfect for a wallet or purse. 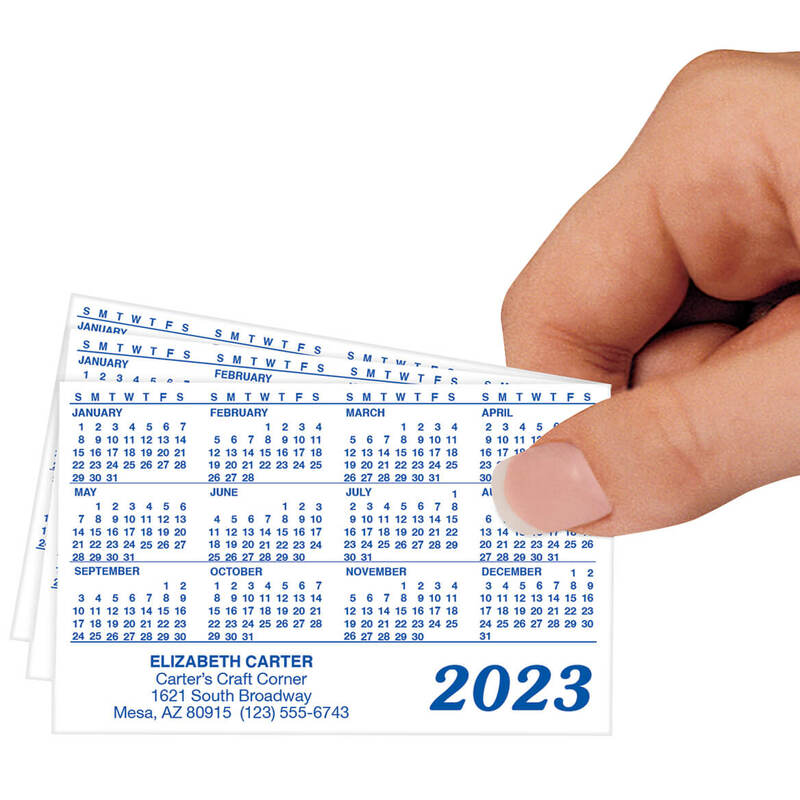 I keep them handy as I am always wanting to know the date for some appointment. They make useful handouts as our name & address are on them. We also use them for note cards. Have ordered these calendars for many years. Would be lost without them. I used these calendars as inserts to our Christmas Cards this year. We had a TON of compliments on the clever idea. The size is perfect for men's or women's wallets and easy to read. I will use these as year end gifts for my customers. I purchase these yearly for staff as they fit nicely behind work ID's As I buy so many, the loss of the larger order discount hit me a little hard. Hate to not get them, but as employees increase, cost may become prohibitive. I actually cut order short (only 350), am out, but hesitate to order more. U have folks that look forward to receiving them each year. Also good as an insert into Christmas Card Envelopes. Include with holiday cards for clients. I buy a package of Personalized Plastic Calendars each year. The calendars make a great addition with gifts. It is also a great idea to put them in greeting cards, or by themselves, as a friendly hello and greetings from friends! For many years I have sent these wallet size calendars to my clients. They love them and some ask for more. Well, I received my 2016 calendars per my order. Unlike the prior years the printing is sort of "fuzzy". It is rather like you selected "bold" type when sending correspondence. But the type size is so small (in order to fit on the wallet size plastic) the result is that the printing is not "sharp" or "clean". Now, it is not so fuzzy as to be unreadable. But comparing it to the calendars I received in prior year's orders the 2016 is not nearly as legible as the prior years. I guess it is possible that it was just my order that was a bad print job.....I will never know. I probably will not buy this product again. The product is to long and will not fit size clear wallet plastic holders designed for credit cards etc. All of my credit cards fit in these holders. The calendars I purchased from you do not fit unless I trim them to the size of a credit card. It was my intention to enclose one of the calendars with each greeting card I send this coming season. I guess this won't happen as trimming the cards does not yield a perfect cut. This is not a purchase I'm happy with. I want to give them to my clients. These make nice inserts in Christmas cards. Just a small token of friendship to let our friends and family know we care. I thought it would be a neat way to advertise my travel website and at the same time give away calendars. I needed a way to let my clients know my office had moved and this was inexpensive. Also, it is something they can use next year. This should keep me in their minds and possibly help me drum up business. I send these along with my Christmas cards, and everyone loves them! They are a quality item that fits perfectly in a purse or billfold. I love that they can be personalized with our names and a message. Since I sell cosmetics, I like to enclose a useful calendar on which my contact information is available to my customers. I enclose these with my Christmas cards every year and my friends love them. Extremely great product for the money. ADVERTISING! I am a Karaoke KJ Host. Every year I give this very professional looking calendars to my Karaoke followers. Every time they need a calendar they see my name, email and phone number. Makes it very easy to contact me for a personal special event they are having. Thanks Miles Kimball. I have been buying these calendars since 2003. To send out to family and friends. I use them yearly to give to clients. They are very sturdy and last for the year. I have ordered these calendars for a few years. I like them. They are durable being plastic, the print has not rubbed off, and they make great little stocking stuffers. I also like to keep one in my wallet for a quick, easy reference during the year. For many years I have included these calendars in Christmas cards for family, friends and neighbors. I chose another style one year and received comments that said go back to the wallet size, please! They are easy to read and include our greeting, too. I got these for me and to hand out. Like it. I order every year. I am going through o share them with customers and parents of my students. People throw away business cards, but love calendars. Great price on personalized item. always buy my cards from Miles Kimball. Always pleased with them. I was looking for a business card, and this was the more appealing option. I do this every year to share with family and friends. I normally put them in their Christmas cards but I forgot to order them this year! Previously purchased the glossy version but I'd like to try the matte version. I mailed these with all my Christmas Cards for my Business. Everyone loved them. I have bought these the past few years for my husbands small business and they are really great. Great to put in holiday cards if you're a business owner!!! I get them every year for family and friends. I want these, but only a half dozen. Can I just buy 6? BEST ANSWER: Thank you for your question. We sell these in sets of 50. We cannot sell them individually.We apologize for any inconvenience. No as it is a set of 50. 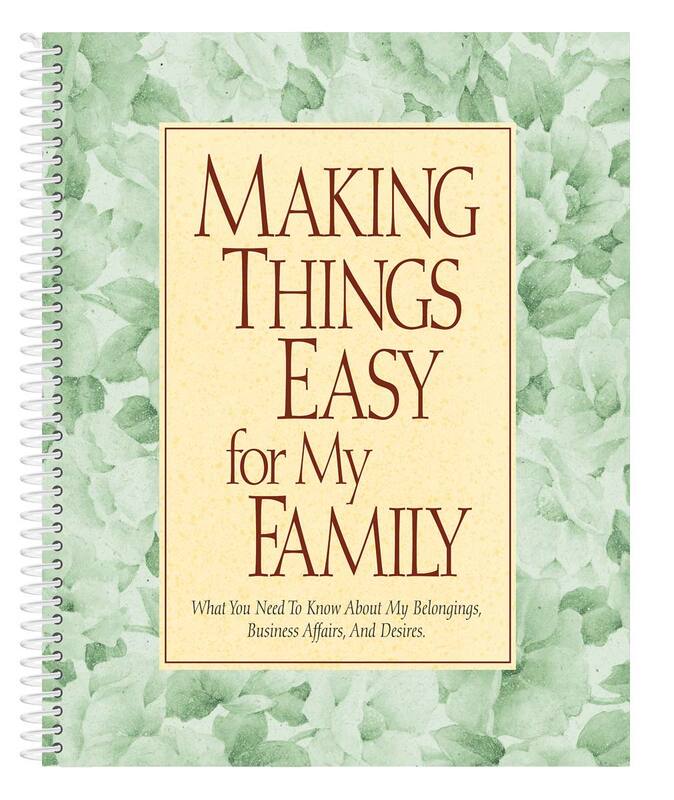 Sorry maybe you could hand out in holiday cards, family, & friends. The minimum order is 50. I bought them. I like them. what is the size of wallet calendar card ? BEST ANSWER: Thank you for your question. They are 3 3/8" x 2 1/8". We hope this information will be of help to you. Do you carry plastic tip cards? BEST ANSWER: Thank you for your question. Unfortunately no we do not carry any plastic tip cards. We hope this information will be of help to you. Can I get them for the year 2019 so I can create my projects with them ahead of time? BEST ANSWER: Thank you for your question. 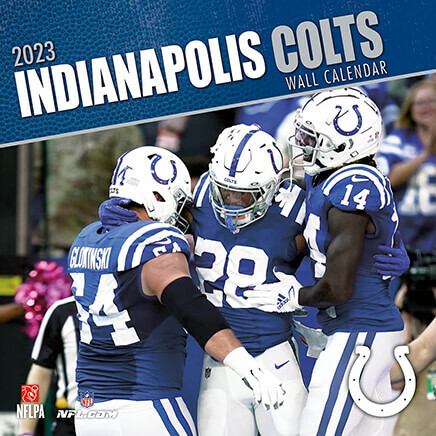 2019 calendars will not be available until August/September. We hope this information will be of help to you. (50 in a box) with the words THANK YOU FOR SERVING? BEST ANSWER: Thank you for your question. At this time the calendars can only be personalized with letters and numbers. We are unable to add any additional personalization to the item. We hope this information will be of help to you. 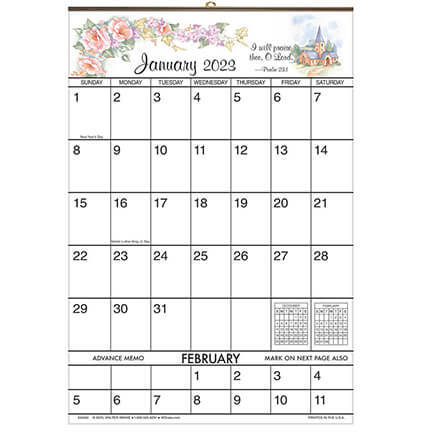 Bible Verse designer 1-yr. giant calendars in a visible 14 1/4" wide x 21 3/4" high size feature large squares for daily notes and 2 weeks of the next month. Bible verse calendar features a new message every month. 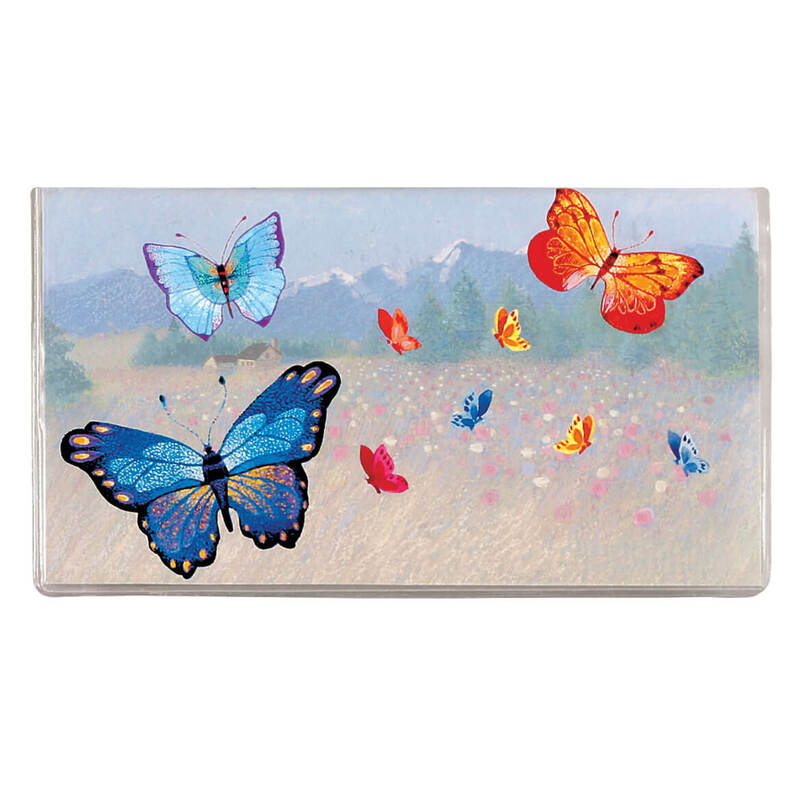 Cheerful butterfly personalized pocket planner features two-year calendar, notepad, and inspiring quotes. Choose from several cute or colorful themes. We’ll personalize. Specify name; limit 1 line, 17 characters. 6 3/4" long x 3 5/8" wide. 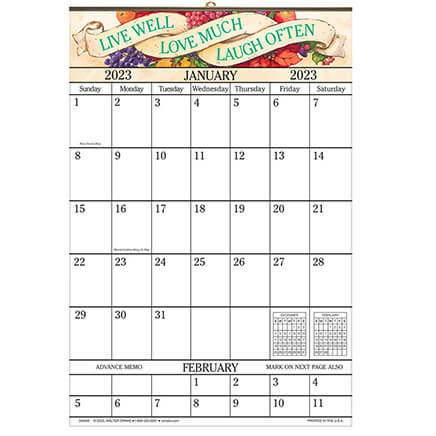 Giant calendars in a visible 14 1/4" wide x 21 3/4" high size feature large squares for daily notes and 2 weeks of the next month.